Warner Bros. 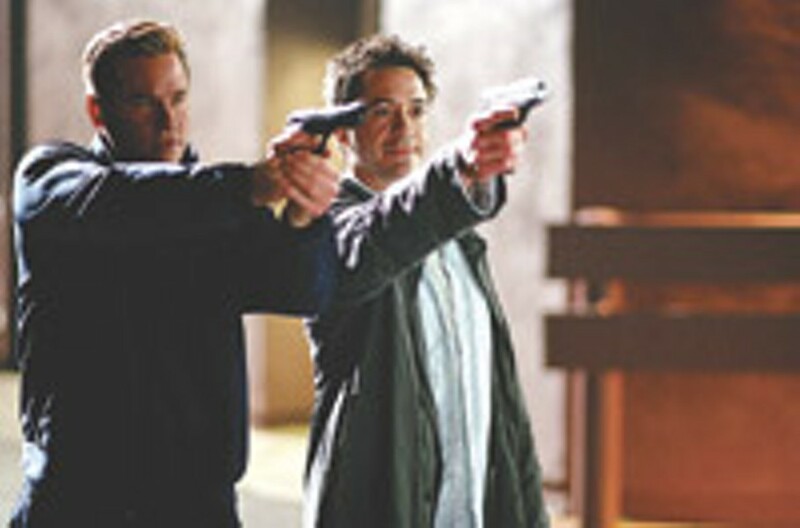 Good-looking warhorses: Val Kilmer and Robert Downey Jr. in "Kiss Kiss, Bang Bang." At the dawn of the 21st century it seemed as though Robert Downey Jr. would be remembered as a cautionary example, just another instance of immense talent needlessly squandered due to an inability to cope. As 2006 looms, however, Downey is at the top of his game. His refined performance in George Clooney's Good Night, and Good Luck stands out among a uniformly stellar ensemble, and in the cunningly fun noir KissKiss, Bang Bang, Downey plays Harry, a East Coast gunsel who stumbles into a West Coast murder investigation and risks his neck to save a skirt called Harmony. None other than Val Kilmer, another notorious gift-waster, joins Downey for this phoenix-like renaissance... and almost steals Kiss Kiss right out from under Downey's formidable nose. Kilmer finally gets another chance to show off his flair for comedy as Perry, a fabulously droll private detective who acts as Harry's tour guide through the seedy underbelly of Hollywood. How is it possible that these two warhorses look so great after such hard living? Redemption obviously does wonders for the complexion. Harry is our fast-talking narrator, and he shows us how he wound up in Los Angeles after hiding out from New York's finest in, and then hilariously acing, an audition. Harry is supposed to study Perry's PI ways for his new acting role, but the bodies start piling up and the two men uncover a connection between Perry's case and the assignment that Harry agreed to take on for lost love Harmony (the impressive Michelle Monaghan), because "detective" goes further than "thief" when trying to sweet-talk your childhood crush. The plot is actually rather arcane and, to be perfectly honest, irrelevant. Kiss Kiss is an excuse to watch virtuoso performers deliver whipsmart lines at a breakneck pace (California, for example, is described as if "someone took America by the East Coast and shook it and all the normal girls hung on"). And writer-director Shane Black divides his dark romp into days using the titles of Raymond Chandler novellas (i.e., "Day 1: Trouble Is My Business"), causing this pulp freak girl to cackle with glee as I tried to guess what the following chapters might be called. It's interactive moviegoing! Black was once the highest-paid screenwriter around, and his fresh script for the first Lethal Weapon effectively drafted the blueprint for the modern-day buddy movie. Black is keenly aware of what he hath wrought, however, and with Kiss Kiss, his directing debut, he seems to get quite a charge out of taking all the clichés he arguably pioneered and satirizing them with a wrecking ball. Fortunately, so does the audience. Unfortunately, though, said audience may have to Netflix this one. As I write this, I have no idea whether Kiss Kiss will last in Rochester theaters beyond one week. For some reason, a quality flick like this opened on just one screen in town, a suburban googolplex where it will most likely flop, thus making way for the juggernaut that is Harry Potter. And this would normally be the part where I would complain about the abundance of venues and the dearth of good movies, but I'm just not in the mood. The Polish Film Festival, organized by the Skalny Center for Polish and Central European Studies at the University of Rochester, celebrates its 10th anniversary in 2005. The closing night selection is Anya (In and Out of Focus), a lovely documentary by Polish-born filmmaker Marian Marzynski about his daughter Anya. Marzynski will be at the Dryden Theatre to present his film, which was most likely intended as an exhaustive chronicle of one woman's evolution but becomes something else along the way. Having fled the Warsaw ghetto as a young boy, Marzynski gets a second chance to experience childhood, this time through the eyes of his American-born daughter. He trained a camera on Anya for 25 years or so, and his footage illustrates a sharp and dramatic young lady only occasionally at ease with the fact that her every triumph and misstep is being recorded. Anya's parents learn about America as she does, especially Anya's architect mother Grazyna, whose reticent racism surfaces once Anya's romantic life begins. Marzynski probably envisioned Anya as a tribute to his daughter, but to watch it you realize that it's also a moving portrait of one girl's unconditional adoration of her father, a man who confuses interest in his daughter's life with the need for compelling cinema. How else to explain the remarkable restraint exhibited by a 14-year-old who merely rolls her eyes and clams up upon being asked the on-camera question, "Do you menstruate?" Kiss Kiss, Bang Bang (R) is playing at Tinseltown | Anya (In and Out of Focus) is showing Friday, November 18, at the George Eastman House's Dryden Theatre, at 8 p.m.